Find what websites link to you. Keep an eye on competitors. Backlink Checker by CleverStat is a free tool to see how many pages and domains link to your website. In just one go you receive a lot of information: what websites link to you; are they quality ones or just ‘link farms’; do they add to your website rank or rather spoil its credibility with toxic links? Find out now! Type your domain name above and Backlink Checker will display the thorough information about links pointing to your website. Enter a domain name and click "Submit". Free Backlink Checker will scan its regularly updated database and displays all links that refer to the website or any page on the domain name provided. This is the summary rank of your website based on the amount and quality of all backlinks. The higher this parameter, the better. Note that this parameter is relative to other websites. So, if you see a Domain Rank of 34, this means your website rank is higher than 34% of other websites in the Internet. Links from trustworthy and authoritative websites increase your trust rank. Links from spammy or suspicious websites or sites that are penalized reduce your trust rank. High trust rank is a must for higher positions. Again, this parameter is relative. This parameter displays overall quality of all backlinks pointing to your domain. The parameter takes into consideration trust rank of linking websites, quality of linking pages, the number of other outbound links on linking pages, and other data. The higher Link Rank is, the better. 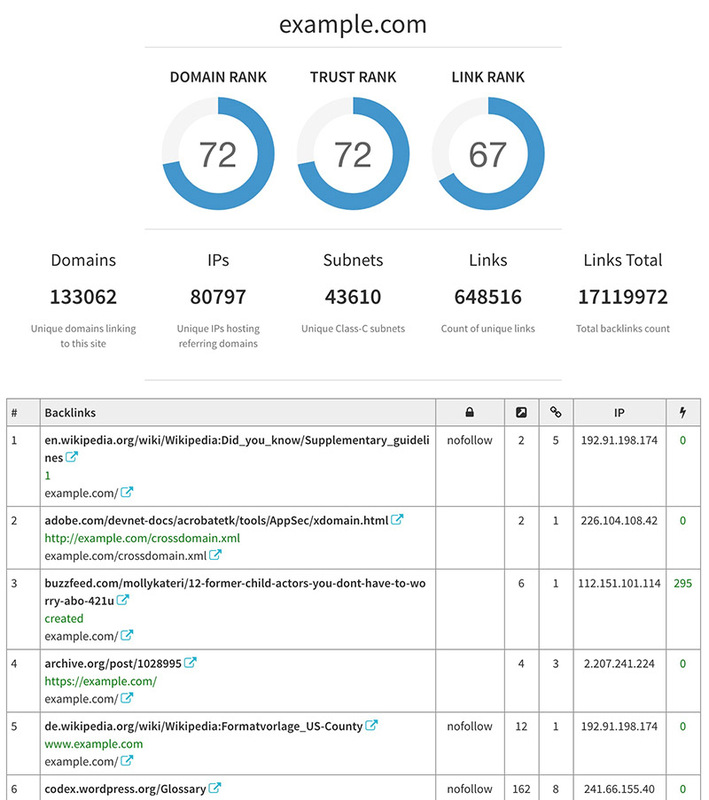 Below are statistical information: how many unique domains, IP address, subnets and links are referring your website, and the total amount of (non-unique) links. The first column displays a link URL (the referring website), the anchor text of the link, and the page on your website this link refers. The second column shows if the link is nofollow, noindex or redirect. Nofollow and redirected links are less preferable, but are still valuable. Noindex links signal to search engines that they should not be taken into account, which makes them of little value. Then there is a total number of outbound links on the referring page. Less is more in this case: the less outbound links a page has, the higher is the value of each such link. On the contrast, if a page contains dozens or even hundreds of links, each such link passes very tiny value to the referred website. The next column shows the total number of backlinks pointing to the specified domain. Then, there is an IP address. And the last column shows quality rank of the link. Low values are better. The table displays first 50 links. To get information on all backlinks, click the “View All Backlinks” button. For a small fee you will be provided with the entire data on backlinks. To repeat the search with another URL, click the “Try new URL” button. Why check for backlinking websites in the first place? Not only do backlinks drive direct visits to your websites from other internet resources, they also are considerted one of the most important ranking factors (and some experts believe it IS the most important factor). Moreover, links from good respectable websites increase the trust rank of your website too, which makes the website look more credible in the eyes of search engines. All together this makes link building a viable and extremely important SEO strategy, while checking for backlinks is like having a finger on the pulse of your website. By regularly checking backlinks you will learn how well your website is doing in the eye of search engines, find out what sites spread the word about you, see if your link building strategy bears fruits, check link donors for fairness, and quickly reveal bad ‘toxic’ links that can hurt you rankings. How often should I check links? Normally, Free Backlink Checkers updates links once every 2 weeks. You can update link information immediately, by clicking the ‘Update Now’ button above. Why is it so important to check your referents? Because backlinks from other webpages make your site more visible in Google. The more inbound links you get, the higher is your rank. But the quality of backlinks that you have is even more important than their quantity. All the major search systems track the backlinks quality. Online marketing agents who use "wholesale links" (very cheap referrals bought in large amounts) as their strategy, get penalties from Google and the likes of it. Therefore, wholesale backlinking can bring you more harm that way. The best way to get a high rank from Google is to use high quality links, even if you have a few of them. Our free online version of Backlink Check Tool can show you in details, how your links work in terms of quality. Copyright © 2003- CleverStat.com. All rights reserved. This Keyword Density Checker tool will allow you to know the density of keywords in your text. Online and absolutely free. A free online SERP Checker tool helps you monitor positions of your website by keywords on Google search engine result pages.